After the appalling flying weather over the winter, the spring didn’t really improve very much and apart from our lucky day out to Elvington in April the weather had been up and down like a yo-yo for those of you who remember what they were. My hopes weren’t high for what was to be our first big trip of the year. This was to be all three of the main Channel Islands, Alderney, Guernsey and Jersey over one weekend. The other element was to encompass some excellent food with as much of a local flavour as possible during our two overnight stays. 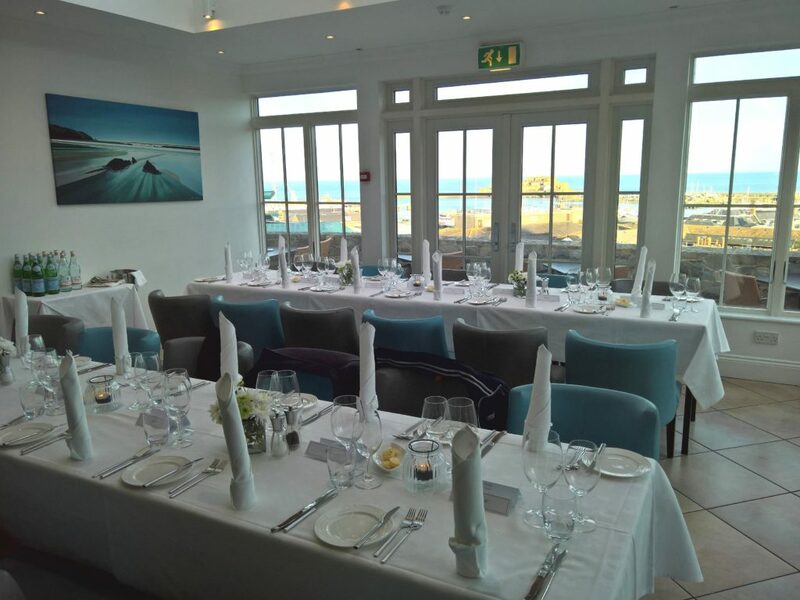 Needless to say, this took an awful lot of forward planning and enquiries, mainly in finding very good restaurants on Guernsey and Jersey that could accommodate 25 people on a weekend evening and not have a prohibitively expensive cancellation policy. All important of course given the vagaries of the UK weather. After much searching and a little negotiating I found what looked like two very good venues who would accept us, although there was no getting around the breaking of my golden rule regarding deposits, however the terms were more than acceptable. It’s become the tradition on the longer trips to allocate an ‘Operation’ designation and this one needed a title which due to the importance of the food element soon became the rather politically incorrect ‘Operation Fat Boy II’ following on from the previous year’s failure of a similar plan due to weather. Funny, the flying is easy the meals were the problem. So back to the flying stuff, well almost. All of the NWFG four-seaters were taking part apart from our PA28 G-NUKA which had already been booked so its usual crew of Pete McD and Vrai were entrusted with the newly re engine C172 ‘FT’ for the trip. Paul Cook, myself and the other half were in VB and we were being joined as usual by ‘The GEEP’, Tony Chapman and Tash in their Arrow G-BBEB from Stapleford, Linda W and James G and wife Becky in new North Weald resident 172 CSCS as well as Alex Kenning and guest Hugh in Monsom AZRA from White Waltham. Needless to say, nothing is straightforward on these trips and Alex reported the day before that after months being repaired after a landing mishap a window had now popped out of AZRA and it was unable to fly. Lacking seats in the NWFG aircraft, fortunately, Tony Chapmans own guests had dropped out so he kindly volunteered to take them aboard ‘EB’ for the trip. Many of the group hadn’t been to the Channel Islands before or certainly hadn’t done all three main islands. John Power accompanied by his other half hadn’t been before and as this was his first fly out it was all the more exciting, which is what it’s all about. The plan was all in place, first stop Alderney for lunch. Onto Guernsey for the first overnight and meal and then onto Jersey for the second the following day. 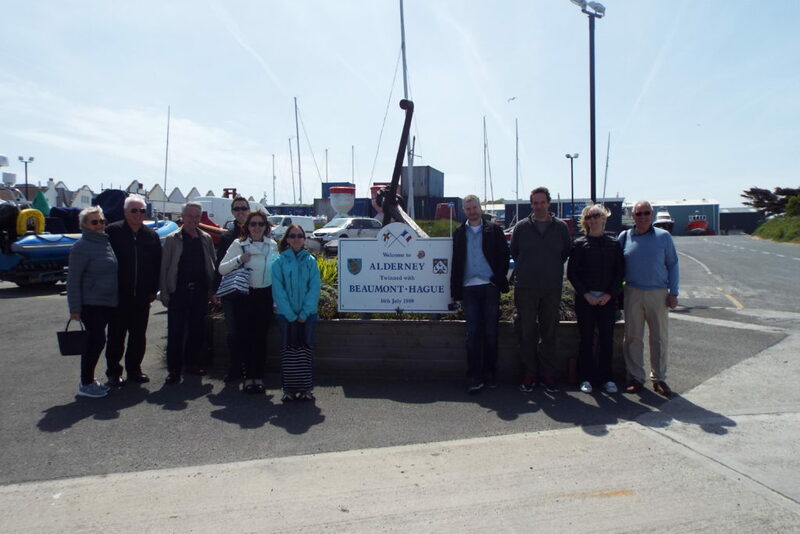 Everyone had booked their overnight accommodation for the overnight stops in Guernsey and Jersey. Again with a single overnight and no ‘ibis’ hotels and their on the day cancellable rate we were spread out at different hotels across the islands where we could find the best terms. Avis came up trumps with regard to car hire on both Guernsey and Jersey giving me a great 24-hour hire rate for the nine cars we needed with no penalty if we didn’t actually get there. All we needed now was the weather and as usual that meant trawling through all the forecasts for a week leading up to the trip to make a call as soon as possible whether it was to be a ‘go or no go’. Amazingly all the forecasts looked good so it was a ‘go’ with the crews gathering on the Friday morning for the usual packing, fuelling and prep required for these trips. We needed to allow a little separation as we didn’t want 8 aircraft to arrive at Alderney or even at the Jersey Zone boundary at around the same time as that could potentially mean a considerable delay in getting in. The only slight issue was the TAF’s were showing the possibility of cloud at 1200ft over Alderney but if they were right it should be ‘few’ well before we arrived. With Flight Plans filed and GARs in the day before we departed from North Weald in a well spaced stream with most us planning to route towards the QE2 Bridge, Tunbridge Wells and then east and south around the Gatwick Zone towards Bognor before coasting out at Selsey Bill and heading to KATHY on the southern tip of the Isle of Wight before reaching the Jersey Zone at ORTAC. Needless to say, the TAF’s weren’t quite right and we had the usual cloud around the North Downs, the base of which is ideally lower than one would like to fly but the tops always seem to be at 2500ft so you can’t get on top due to the LTMA airspace above. Speaking to Farnborough we elected for a traffic service and sat at 2300ft in the cloud, very nice it was too, not too bumpy and flitting in and out of the fluffy bits gave us those great views of blue sky above and glimpses of the fields below. The somewhat inaccurate TAF so early was just a little warning though for what happened later. By the time we had passed MAY we were back into the nice clear air as we routed along the South Downs towards Bognor which is always an enjoyable leg. 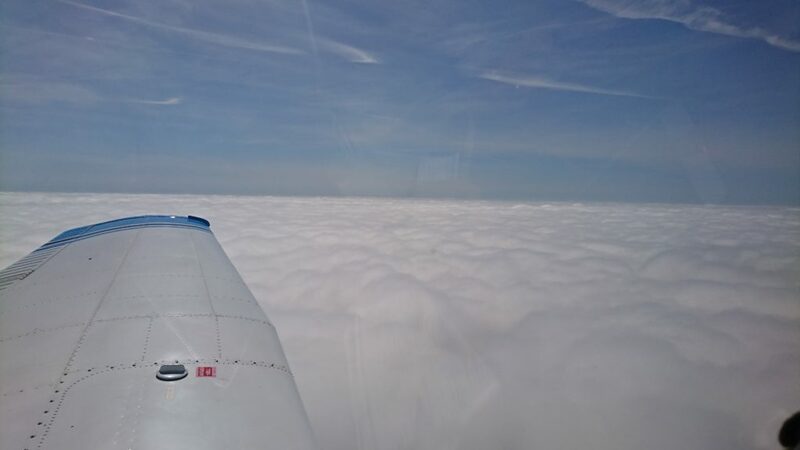 However, as we headed towards Selsey it was clear that there was a low layer of cloud sitting over the Channel but the sky above was crystal clear and given the TAF I thought it would either be gone or nicely broken up by the time we reached Alderney. Now with London Info we coasted out with a great view of Portsmouth and the Isle of Wight on our right as we headed towards KATHY. Just south of KATHY the cloud was solid as far as we could see at around 2300ft so even though the backup plan was an ILS into Guernsey if it hadn’t cleared it was decision time as to whether to continue or not. With several of our number on the frequency I called London Info for a weather update at Alderney and was told that the cloud was scattered 1200ft, visibility in excess of 10km and the wind 14kts from the east, so all fine then. With a change to Jersey Control at 20 miles from ORTAC we had our clearance into the zone at 2500ft. ORTAC came and went and we were still on top of the cloud and it was quite clear that as we should now be visual with Alderney there was no way it was scattered clouds at 1200ft as reported. Not quite scattered at 1200ft! Now under a Radar Control Service we were instructed to descend to 2300ft due to opposite direction traffic and that took us about 100ft into the cloud which was fine but I wanted to get back VFR and visual for our approach to Alderney so requested a further descent to 1000ft which was going to be my breaking cloud lower limit over the sea, which if we were still in cloud at that height it would be up again and a divert to Guernsey. A gentle descent at 500ft per minute had us bumping through the unexpectedly dark cloud. At 1300ft Paul said he could see flickers of the sea below and we broke cloud at 1200ft and into what can only be described as murk below with white caps on the sea as a result of the reasonably strong wind. The hazy lump of rock in the distance was obviously Alderney and reporting the Island in sight we were changed to Guernsey Approach and instructed to position LH downwind for R08 as number 2. Approaching the downwind we were then changed to Alderney Tower and told to report left base as number 2. It was a pity about the murk as the approach in good weather to either runway at Alderney is always spectacular with the incredibly rocky coast and high cliffs surrounding the island never failing to impress. Turning left base we were told to be aware of soaring Gannets over the Gannet Colony which is several huge chunks of guano covered granite called ‘Les Etacs’ rising steeply from the sea just close to the turning point for final to R08. These big spectacular seabirds have nested here since a single pair started the colony in 1940 and where there are now more than 5000 birds. A great sight. Cleared to land and we slipped nicely down a quite lively final before kissing the tarmac with the tyres and vacating to the rather sloping grass parking area which is very nice in itself with the sea visible on three sides. With our Alderney GAR forms completed (with some ridiculous data protection nonsense involved), we headed off by a minibus cab into the main town of St Annes for lunch in the Braye harbour area to get ‘Op Fat Boy II’ underway. Lunch on the harbourside at the Mooring restaurant was very nice and quite acceptable although we were a little restrained as we were saving ourselves for later! Although now quite bright is was pretty cool with the lively breeze off of the sea as most of us headed off for a walk down the long breakwater that dominates the harbour and it wasn’t long before a few of our number were heading back to shelter of the town. Part of the group wrapped up against the cold wind. We had arranged for the minibus to pick us up and it duly arrived on the dot to take us back to the airport. 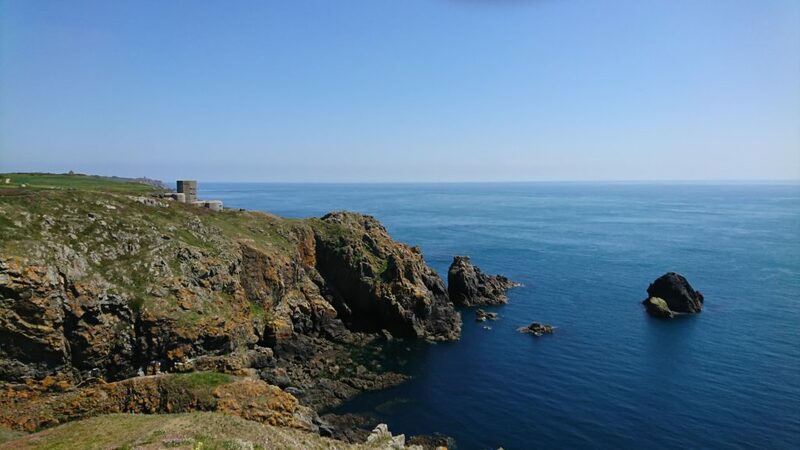 An inter-island flight plan is required for the flight from Alderney to Guernsey but we just found it simpler to file a full plan via the magic of Sky Demon. With us all settled in the aircraft and having ensured our departures were pretty spread out to avoid any congestion at Guernsey we prepared for the 22nm flight that would be around 15 minutes flying time. Getting airborne was pretty quick with the wind on the nose and we were soon over the cliffs and in a right turn over the sea towards Guernsey with a ‘not above 2000ft clearance’ It was pretty hazy and Guernsey wasn’t visible as we left Alderney but came into view as a blob on the horizon at about 15nm. 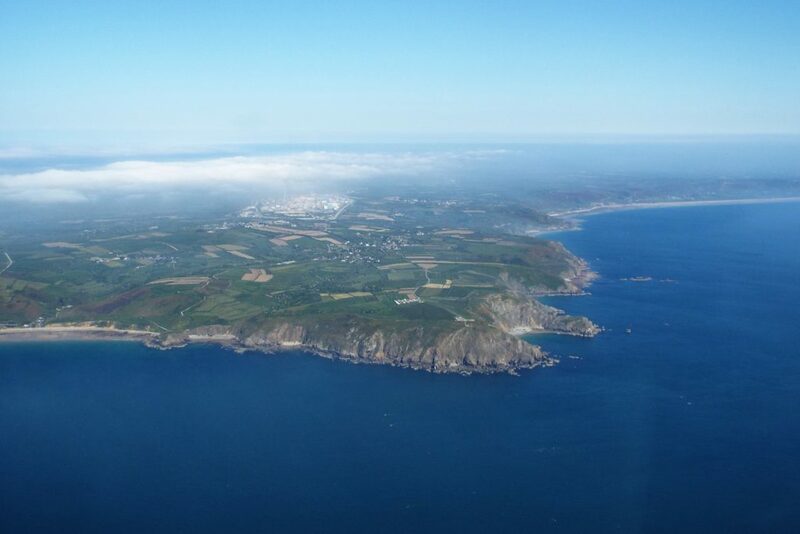 With a listen to the Guernsey ATIS on box 2 we soon changed over to Guernsey Approach. Hoping for a bit of instrument practice I requested a radar vectored ILS if they could accommodate it and the obliging controller vectored us out to sea and around the island to pick up the ILS for R09 from left base which gave Paul C and Lin a great view of the island whilst I had my head down in the cockpit. Landing nicely at Guernsey we taxied to the ASG apron where I had arranged for our aircraft to be parked. The sun was now shining and the marshaller did a grand job of getting our aircraft nicely parked in neat rows. Passing through the hanger on the way to pay our very reasonable landing fees we had a good view of the ingenious aircraft stacking system inside the hanger which by clever design and the power of hydraulics allows twice as many aircraft to be hangered if they were all on the hanger floor. A wander over to the main terminal and the Avis desk had us picking up our hire cars in quick time despite them having a rush with our lot rolling up almost together. We then headed off to our respective hotels with the plan to meet at our first main dinner venue the ‘La Fregate Hotel’ at 19.30 that evening. Having been sent on a wild goose chase by Google Maps we finally found our hotel the Auberge Du Val which if you are in Guernsey for an overnight or longer is very nice although in a rural spot. Trying to find the hotel for the dinner turned into a saga as well as it appears a bit of a local sport that road names and signs are kept a secret and they throw in a rather strange and what I personally consider potentially dangerous ‘rule of the left’ where at certain junctions traffic emerging onto the main road from the side road has the right of way. The locations of these are shown on the local car hire maps but beware! That’s digressing from the main event outside of the flying of course. La Fregate Hotel sits in a dominating position overlooking the town and harbour at St Peter Port and I had booked a private room in the Orangery with large panoramic windows to take in the view of what was a great evening. La Fregate Orangery and some of the group. I won’t go into the details as it will make me feel hungry other than to say the three courses were absolutely excellent as was the wine and the service. With a setting sun as a backdrop over the harbour as we enjoyed a great evening made it an all-round perfect evening in all respects. I would like to thank all those involved at the hotel for a great dining experience. It was then back to our hotels and the following day was a free one until the middle of the afternoon when we were going to do our next hop to Jersey. We had a great exploration of the island, driving through picturesque tree lined lanes and onto the coast road to do a circular tour with of course some dressed crab at a beachside café just to keep the gastronomic side ticking over. The weather was great with most of the haze now cleared. All too soon it was time to head back to the airport to drop off the hire car and get our flight plan in for the 21nm 11 min airborne flight to Jersey. With everything ready and lifejackets on we saw that Gordon and the GEEP crew were having an issue which turned out to be a completely flat battery, so flat in fact that even Gordons brave hand swinging of the prop and starting the engine failed to kick the alternator into life. Unfortunately, there was nothing we could do for them but luckily there was an engineer at hand we left them on the apron in the hope that they would catch us up in Jersey later. Back to the flying, with the ATIS listened to and a request to start granted by the Tower we were up and running and after receiving our clearance of direct to the NW corner of Jersey VFR not above 2000ft we were soon taxiing out for departure on R09. After a landing Flybe Dash 8 we were cleared to take off and the climb out and right turn gave us another great view of the Island with St Peter Port to our left as we passed over the coast with the crystal clear blue water below. Jersey ATIS on Box 2 and then it was a hand off to Jersey Approach. Taking advantage once again of the opportunity to do some instrument practice I requested a radar vectored ILS for R08 and the controller said it was no problem and promptly gave us headings for the localiser. Taking a route further out to sea to pick up the ILS at around 7 miles gave some great views of the Island and with the approach over the beach at St Ouens and the cliff on the airfield boundary, I think it’s still one of my favourites. Nicely touching down we rolled to the fast turn off point and were cleared down to the Jersey Aero Club which is located in its own designated area at the eastern end of the airfield. 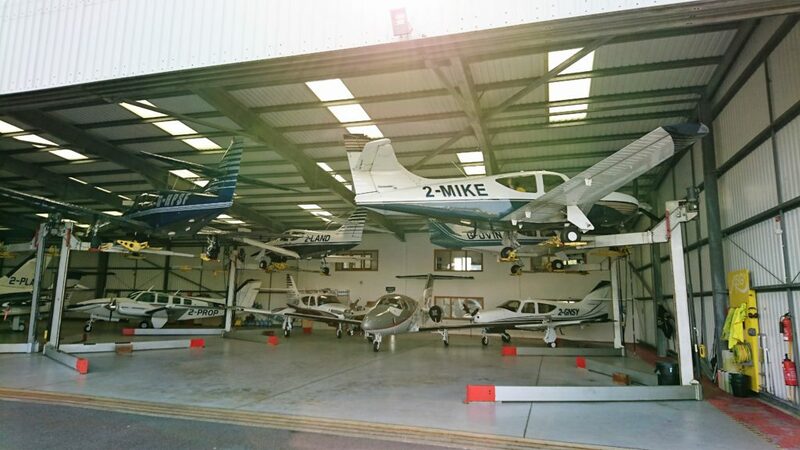 It’s always a pleasure going in there as it is inexpensive and efficient, offers very cheap fuel with an extra discount for AOPA members and must have one of the nicest locations of any UK aero club with the restaurant and balcony being close to and giving a great view over the airport. The downside is the food, it always used to be very good with an excellent choice and some really good specials but it now seems to have just some real basics. A real pity as it was worth a visit for lunch alone, maybe it will change again in the future, I hope so. Parking was the issue this time with the visiting aircraft grass parking area very congested and with limited room between rows extreme caution was required. However, we were all in and wrapped up for the night and whilst half the crews did the bits of paperwork those of us with hire cars boarded the AVIS mini bust for the short ride to the garage. With everything ready for us we picked up our cars and headed back to the Aero Club to collect the others before disappearing once again to our individual hotels. 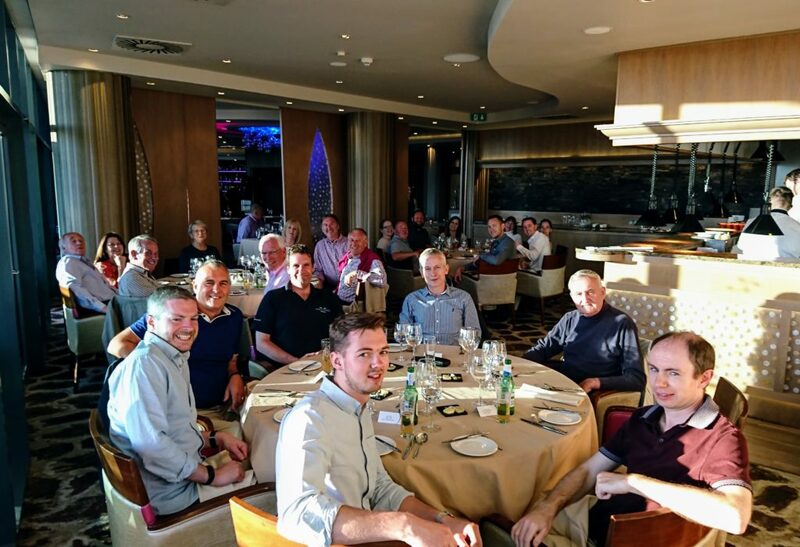 That evening we were booked for our group dinner at the Royal Yacht Hotel in their Sirocco restaurant on the first floor. The Royal Yacht is in St Helier and overlooks the Weighbridge and the harbour. We had to delay for about 30 minutes to allow Gordon, Joanne and Ian to arrive panting after finally making it over from Guernsey once the GEEP was finally fixed. All I can say is that once again we were looked after incredibly well, the setting, food and service were simply outstanding and a very enjoyable evening was had by all. 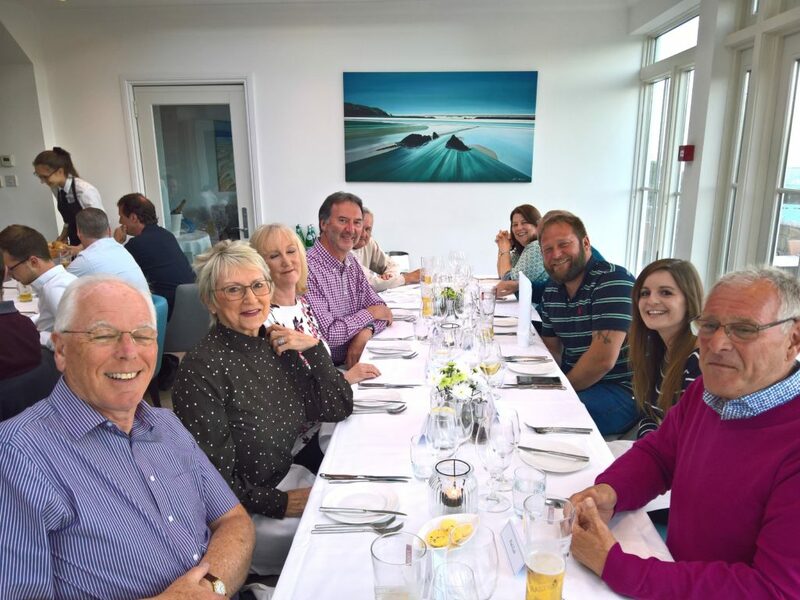 It’s a close call between the two restaurants that we experienced, both were excellent but the consensus was that The Royal Yacht just took the prize for the better all-round experience. After dinner, it was back to our hotels with the same arrangement as in Guernsey for a free day the following day with an opportunity to explore the island and to leave to return to NW when ready. We had a great day and carried on with the food theme by partaking of a very nice crab lunch overlooking the castle at Gorey. Unfortunately, it was necessary to head back to the airport so that we could be safely back into NW before the 18.30L cut off time for Flight Planned returns. Avis allowed us to simply leave the cars at the aero club which saved an awful lot of faff time. With our flight plan filed and the tanks brimming with the cheaper fuel it was time to head out to the aircraft and don our lifejackets for the long over water flight back. Once again, tuned in to the ATIS before a call to Jersey Tower for start clearance. With the engine spinning effortlessly into life at the first turn we reported ready for taxi and were told that they had our clearance and were we ready to copy? After departure, we were cleared with a left turn out direct to Cap de la Hague, VFR not above 1000ft. With that read back we were then cleared to holding point A3. 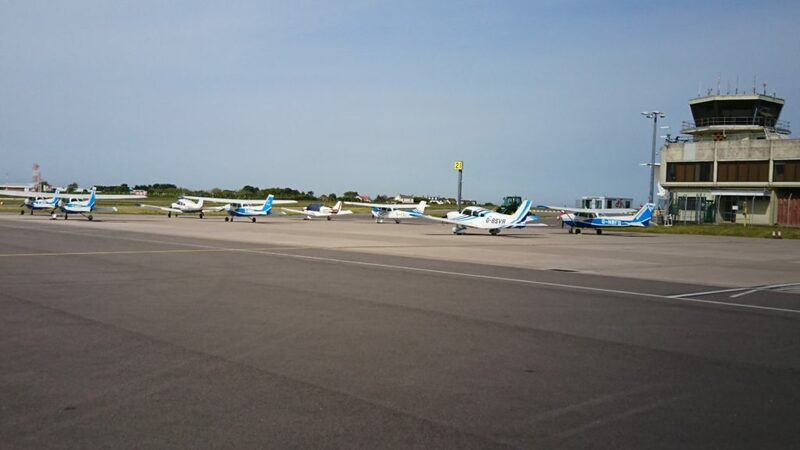 It’s a long taxi for 08 at Jersey from the club and A3 is well short of the main apron. On reaching A3 we found another PA28 there already and there we sat, and sat, and sat before the Tower eventually came on to say that they were getting several aircraft pushed back and that they would get us moving as soon as possible which was just as well as we now need the door cracked open to get some air circulating given the very warm temperature outside. Finally, we got our further clearance to holding point Delta for R08. With a couple of commercial departures ahead of us and an arrival, we had another delay at Delta but the controller fitted in the other PA28 nicely between them. It’s always wise to build in a bit of faff time at larger airports and this proved very much the case this day as we were lining up some 25 minutes after our initial start but as I’ve said on write-ups before, it’s good to play with the big boys occasionally! Departing Jersey over the north coast. 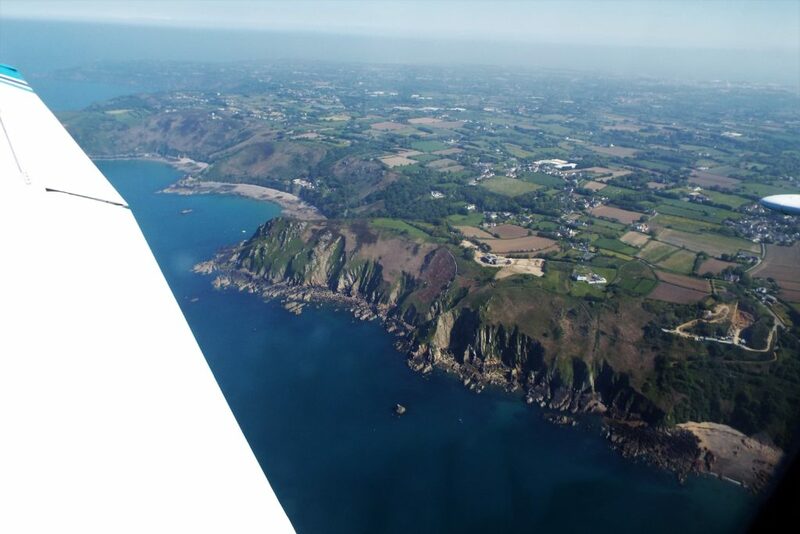 Airborne and climbing quickly to 1000ft we headed towards the north coastline with lovely views over the island from that height especially as we passed over the high cliffs rising from the sea around the bays of Rozel and Bouley Bay. It was a bit hazy but no real problem although you do get a good view of the sea, boats and I swear a few big fish from 1000ft! A few miles off the coast we were changed to Jersey Approach who asked us if we would like a climb, requesting 3000ft this was approved and to report reaching. Reporting at 3000ft we were then changed to Jersey Zone. At that height we were above the haze layer and with the sky clear we could already see the top of the Cherbourg Peninsula with a long dense line of low cloud along the coast above the big nuclear reprocessing works and power station, both of which are ones to keep away from. Cruising towards Cap de la Hague it was super smooth and the sky a brilliant azure blue, a true flying delight. On passing the point we were told by Jersey Zone that it was a Basic Service after 50 north. On passing 50 N we requested a change to London Info and got a service from them for our route back via ‘Kathy’ and Bognor Regis. The flight was effortless and the shipping in the channel as interesting as ever and there were also a large number of small yachts about which is reassuring as in the event of an engine failure that’s what I want to pop the plane into the water next to increase the chances of a quick pick up, hopefully before I even get wet! Coasting in at Bognor we changed to Farnborough Radar and then followed the well-trodden route of Uckfield, Tunbridge Wells, QE2 Bridge before a change to NW radio on approaching Ongar. All were back in safe and sound apart from the GEEP crew who were staying an extra day. It took a delay of a year and an awful lot of organising but taking all into account this was probably one of the best fly outs we have done which is saying something after so many trips over the years. Excellent weather, great flying into beautiful places with very enjoyable company and stunning food. 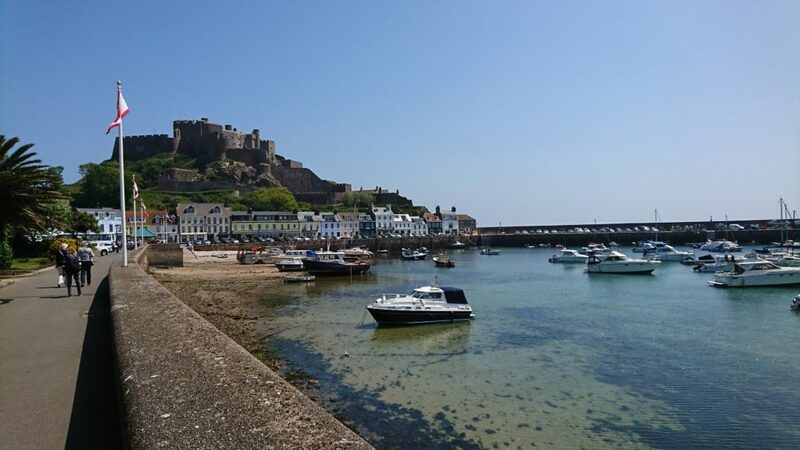 It was good for those of us who had visited the Channel Islands before but for many of our number who hadn’t at all or maybe one of the islands it was very worthwhile trip with a great deal of experience gained. All I need now is to think of how I can match it in the future. New 2018 trip dates have been set. See below if you would like to take part.